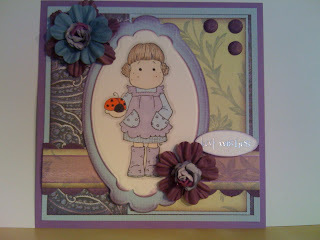 My little challenge today was to use spotty paper!! 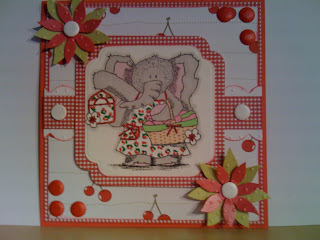 This challenge was alot easier then my last one, I just love spotty paper!!. 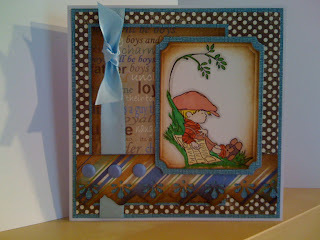 The paper is from Funky hands papercraft factory, their brand new CDRom that came out in January, and it's fab!. I have quite a few of their CDRoms, sooo very easy to use and have great colour combo's, so not alot of thinking when putting the papers together. 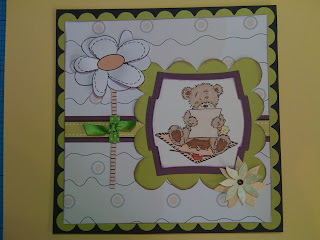 I also used Daisy and Dandelion stamps for my little challenge, great images to colour in and so cute and adorable, stamps coloured in with my beloved Promarkers ( what would I do without them!! ). I hope you like my little works of art today, please feel free to leave a little comment, it's lovely to hear from you all, I really appreciate them!! Rian - Elizabeth Bell/ Dressed up - Wild Rose Studio. My little personal challenge today was to use black and white paper! !, not as easy as it sounds. 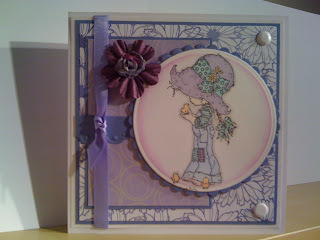 When trying to think of a design, everything was looking quite dark (obvious, I know!! 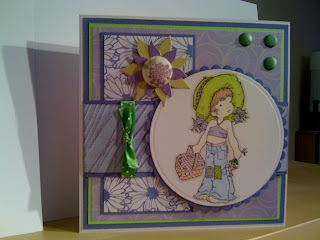 ), but I wanted to use these particular stamps with a little bit of spring thrown in. 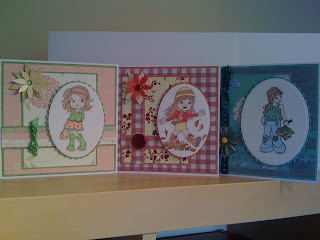 So these are the cards I made, what do you think??. I am very pleased with Rian image, the stamp is so cute and I love the colour combo on it, and the little girl with the umbrella is lovely too. The one I had issues with was "Dressed up", but I think it turned out well in the end. 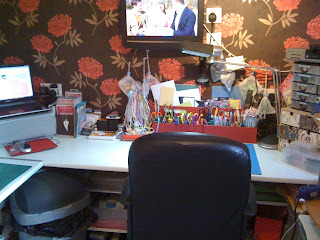 Hope you like my new gadget - my little slide show - I think it's fab!! All stamps coloured in with promarkers. 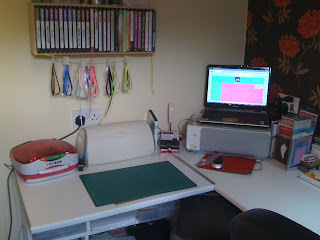 Thanks again for looking at my blog, and look out for more of my personal challenges!! 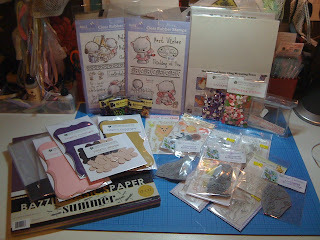 My challenge today was to use free papers we receive in craft magazines!! How many of us look at the free papers and never use them?? , well I do!! I receive many mags thoughout the month, far to many to mention, but today I did receive my new copy of Quick cards made easy and guess what?, free papers!! That gave me a challenge, and inspiration to use them, with these new Sarah Kay stamps that arrived today too. 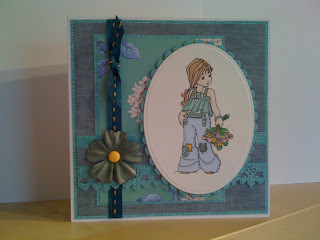 How sweet you are - free papers!, Ribbon from stash, pearls from stash, flowers from flora Doodles, faux stitching, spiced marmalade distress ink and nesties. 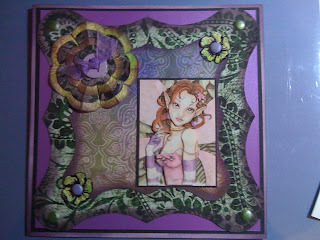 Elodie in the garden - free papers from QCME, ribbon from stash, flowers stamped from a creative expressions stamp plate, card candy, broken glass distress ink and nesties. 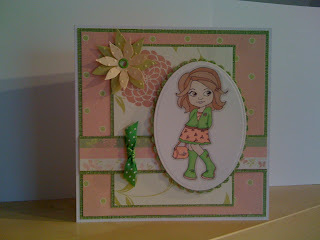 Spring is back - free papers from QCME, ribbon from mag, flowers from creative expressions stamp plate, broken glass distress ink and nesties. 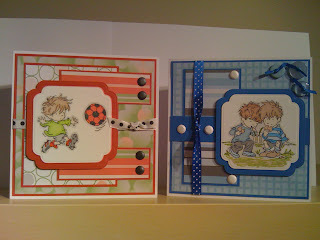 All stamps were coloured in with Promarkers. I think I done quite well with the papers, and I have many more to use!!. I normally print most of my papers from CDroms, which I love especially Funky Hands, Polka Doodles, Joanna Sheen to name a few, but ink seems to have gone in price, as I found out today!! ( 2 cartridges=£35!!). Try the challenge yourself, you might find you save a few pennies to buy other goodie!! I hope you like these cards !! Sarah Kay stamp - A lollipop for Suzan. Sarah Kay stamp - Country girl. Just want to say a BIG THANK YOU to my new followers, It's sooo exciting that someone is looking at this blog, not just me!! Anyway, I thought I will show you my new master pieces that I have made today!! 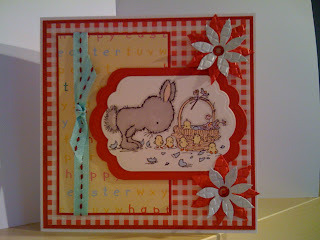 These lovely stamped images are from Sarah Kay, I just love these stamps and you might of gathered, I have quite a few! 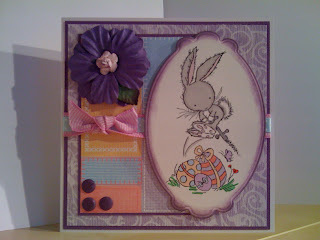 A lolliopo for Suzan was coloured in with Promarkers, Funky Hands word book cdrom papers were used as backing papers ( a fab cdrom - please check out all there cdroms-sooo easy to use and I have them all! 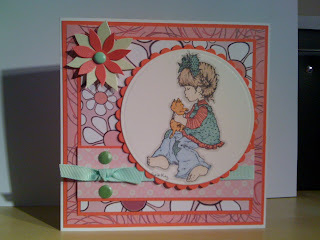 ), stamped flower was from creative expressions, card candy and Martha Stewart punch round the corner double loops punch - My new toy!. 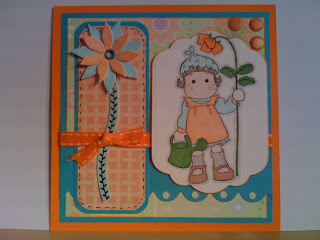 Country girl was coloured in with Promarkers, Backing papers was again from Funky Hand word book cdrom, card candy, Flora Doodles flower and same punch as above. My new toy is the fab Martha Stewart round the corner double loops punch - never used these punches before, but it was sooo easy to use so I will probably need to buy some more!! At the weekend, my mission is to make a 60th birthday card for my lovely mum, who is coming over from Spain, then going to Arizona/ Las Vegas - so very lucky, so watch this space for the card. Again, A big thank you to everyone looking a my blog!! 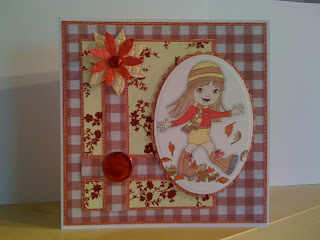 Victoria case - "AUTUMN"- SCACD Stamp. Victoria case - "AUD" - SCACD Stamp. Elizabeth Bell - "SUSAN" - SCACD Stamp. 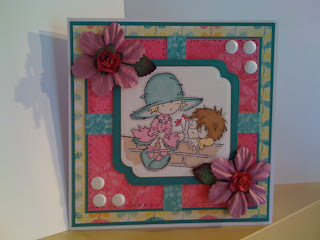 I found these lovely stamps on Crafters Companion web site, and they are simply gorgeous. I have other SCACD stamps, so hopefully will be useing them in the next week or so, so watch this space.!! 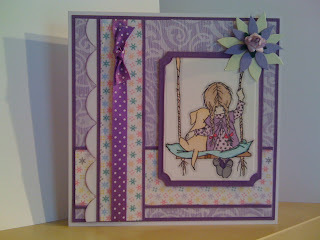 SCACD stands for Susanas custom art and card design and comes from an artist in America. The papers used on "SUSAN" and " AUTUMN " are from Laura Ashley Love song papers. The papers used on "AUD" are from Laura Ashley contemporary papers. 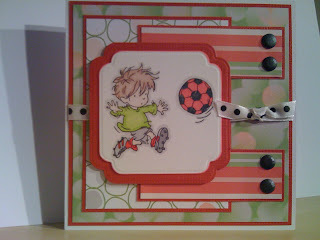 I have had these papers for a while and I thought they went perfectly with these stamps, what do you think !!??. 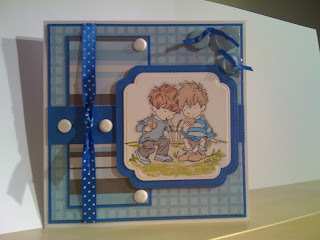 Sooo cute these images !! 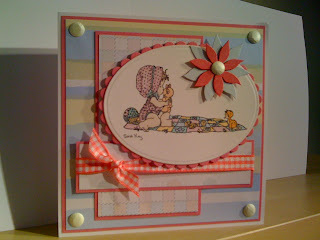 Today I made these fab cards for a lovely charity called Post Pals - a charity for sick children. 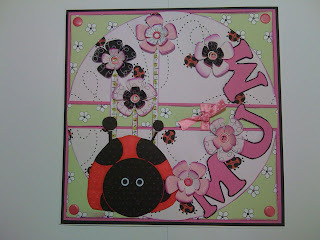 The charity gives them cards to make them happy when in hospital for long periods of time and they also sell them. As you can see I just love Sarah Kay stamps - simply beautiful images. I will be making some LOTV cards at the weekend, so watch this space!! 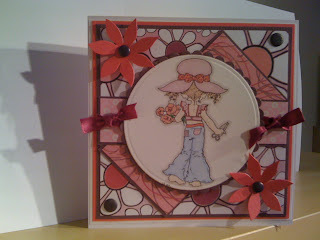 I thought I show you some of my cards I made on mothers Day. As you can see I have been very busy and I just love Pickles - how cute is she!! 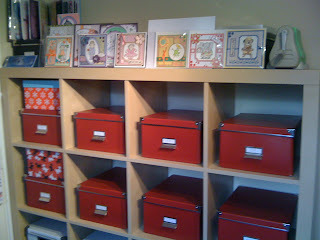 I thought I share with you my great craft room my lovely husband made for me last year. 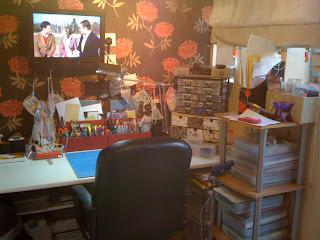 As you can see its quite tidy at the mo - but you should see it on a bad day!! (at least it's out of the house so I can leave it messy). 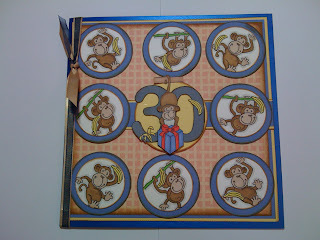 Made this card for my friends so who will be 30 in a couple of day - apparently he was a very hairy baby!! 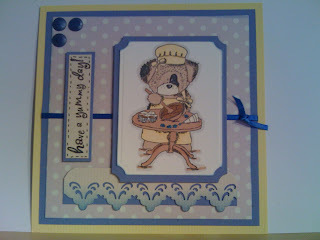 I made this card for my mum for mothers day. My lovely mum lives in Spain near Alicante - and the weather is bad there as it is here at the mo!!. Spoke to her today and she received her flowers from us - which is a miracle as her address is very complicated!! Mum will celebrating her 60th birthday in a couple of weeks - so I will be busy making a special card for her - so watch this space!!. I thought I would share with you a few of my goodies I bought at the Farnborough show a few weeks ago. As you can see I really enjoyed myself soooo much I did spend a small fortune! !, but what fun. Unfortunatly, I have not had a lot of time to play (work boo woo!!) so hopefully over the next few weeks I will be showing you some of my new booty I have bought.